It was a partly sunny day and just above freezing when eight of us got together to paint on Victoria Street in Dundas. I love the old houses on this street however with all the porches, posts and dormers they are challenging to get right. I have failed attempts at most of them to prove it. I was trying to decide which house to struggle with when I turned and looked up the street. Everything seemed to be pointing to this big old house at the end of the street. There was a Hydro one tuck at the other end of the street but well out of the way, or so I thought. There was a steady stream of big hydro trucks coming and going the whole time that we were there. Add to that the fact that every once in a while a car in my painting would leave and another different coloured one would show up and park in a different spot. All plein air painting has it's challenges but today was more distracting than normal. Having said that I was outside, the sun was shining, it was above freezing (just) and I was with friends and I had a paintbrush in my hand. It was perfect. I also ended up with a painting that I am happy with. Maybe. My plan two months ago was to focus on my art and then life got in the way. I have been extremely busy doing non art things since before Christmas and sadly I can't see that changing for the next month at least. On a brighter note I just received notice that my painting "Agawa Point" was accepted into the Burlington Fine Arts Association's annual juried show. A large number of very talented Burlington area artists submitted paintings and a juror selected what they thought were the 28 best for the show. This is especially exciting for me because most, if not all, of the other works are much more refined studio pieces and plein air paintings don't usually fare well. The show runs from Friday January 18th until January 27th in "The Hub" which is a community space in the Burlington Centre (Burlington Mall) just inside door #1 and across from Cogeco. The Opening Reception is Friday January 18th from 7-9 pm. I want to remind my friends whose work wasn't select that the choice is purely subjective and at the whim of the juror and they all have biases. On October 20, 2018 a group of us set out on a canoe trip into Killarney Provincial Park. 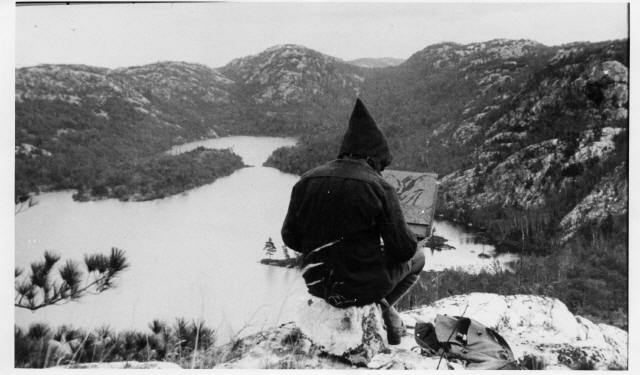 My quest was to sit and paint on the rock that Franklin Carmichael sat on in 1935 and to climb up to the top of the cliff where A Y Jackson painted his sketch for Nellie Lake. I had wonderful and talented artistic company in the form of Martin Kotyluk a Sudbury artist. We arrived at Grace Lake just as the sun was setting so we ate supper and settled in for a very cold (-4) night. at Grace Lake in this 1935 photo. It was a tough unmarked climb up to Carmichael's Rock but once up top it was obvious why he chose this spot. The views were magnificent. Being inspired isn't always a good thing for me. I knew that I would likely never get back this way again and so I only had one shot at it. We were rushed because we knew that after we climbed back down we would still have a rugged uphill 2K portage before supper. This isn't a great painting however considering the conditions that it was painted in I am more than happy with it. The cold damp temperatures kept the paint soft so it, as well as my others, got pretty beat up during the rest of the trip. We had a layover day on Nellie Lake and the cliff that A Y Jackson painted from was right behind our campsite. It was an even higher and tougher unmarked climb but again it was worth it. We had fantastic views of Carmichael (Nellie) Lake, The Notch and also north out of the mountains towards Espanola. I was tired and exhausted but forced myself to sit and do two paintings. I am not excited about them but the experience of sitting painting where my idols once sat is exhilarating. The next day we portaged all our gear down the steep 1420m portage through The Notch . I stopped for a break at a waterfall about half way down and painted what is in my mind my best painting of the trip. This was painted in about twenty minutes and I was, at the time, too tired to care if it worked or not. These last two painting were painted on Little Bear Lake. The most exciting thing about these paintings is the fact that Morgan, my 13 year old granddaughter, and her friend Onalee asked if they could have a board each and some paint. Sitting painting and chatting with them was the highlight of a trip of highlights. I thought that I had posted this three weeks ago but now remember that I went looking for images to use and never came back. I am now using images of some of the paintings that sold during the weekend. When I was invited by Angela and Fred of Dragonfly Designs to be a guest in their studio for the Beyond the Valley Studio Tour I jumped at the chance. This tour has eight studios with 16 very accomplished artists and artisans so I was excited. I have been involved with many shows so how hard could it be. There were some tense moments but it all turned out to be relatively easy and sales were extremely good. I had a couple of credit card glitches. A couple of people got a deal because I forgot to charge for the frames and I told a few people that I would get their email address from the receipt and add them to my newsletter. Sadly the credit card processing company will not give me any information at all about purchasers (which is mostly good) including their names and email addresses (which is not so good). I will be eternally grateful to Angela and Fred for inviting me but also to Shelley Prior of Shelley Prior Fine Art for lending me her racks. Most of all I would like to thank all the wonderful people who came by to look at, chat about or buy my art. You all helped make the weekend a spectacular success in my mind. I was also having so much fun that I didn't think to take any photos of my setup so if anyone has any I would love copies.